Vacation season has started and it’s time to think about various outdoor activities, such as picnics, camping and hiking. It’s time to make your travel dreams come true! However, sometimes traveling can turn into a headache when you’re not prepared. 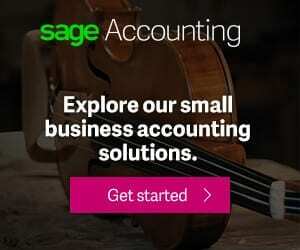 This review of the latest travel gear and gadgets will help you travel with comfort and make your long-awaited trips enjoyable. Waterproof and shakeproof multifunction compass (VONOTO) will help you not to get lost once you’re going to camping somewhere in the wilderness. This gadget was invented under the highest standards of the US military industry. 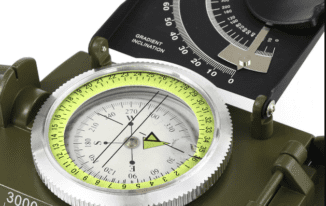 Along with maps, Professional Compass can coordinate you wherever you’re: in the deep forest or in the mountains. Its additional functions involve phosphorescent illumination. Here you can see more to the point. 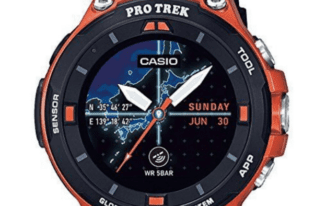 Casio Smart Watch for outdoor activities meets the highest military standards of US. 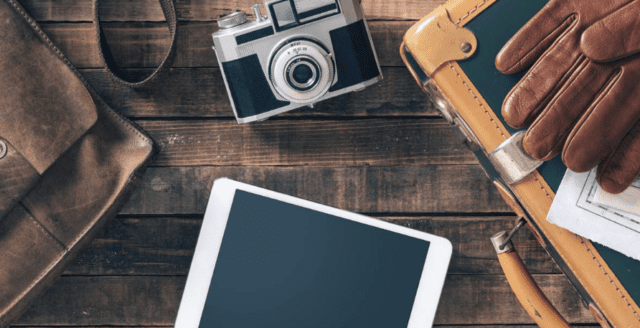 This gadget is probably one of the most essential tools for any wanderluster who is going to explore the world through its length and breadth. Smart Watch is a state of the art piece of technology equipped with a dual-layer display, waterproof (up to 50 meters) and shake proof. This innovative Smart Watch has complex sensors which provide accurate activity tracking based on real-time observations. Among its additional functions are a barometer, altimeter and many other functions you may need during your trip. It is one of the best items among all Android smart watches currently available on the market. Often when you travel you need to cut something, open a bottle or even fix a zipper on your backpack quickly. 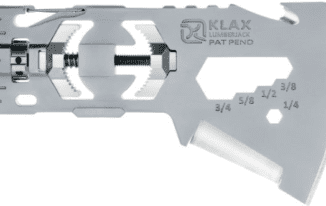 Multi-Tool Ax System has seven tools to satisfy all your needs when you travel far from home. It has a hammer, bottle opener, knife, hex driver, carabineer and many other useful tools. This gear was specially designed for outdoor use and its clamping system allows attaching it to any handle during your trip for more comfortable transportation. One who once went hiking or camping knows the real value of shower. Solar Camp Shower is made of PVC, equipped with strong and convenient handle. It uses solar energy to make warm water. A convenient valve of the shower is connected to shower head to make your shower as much comfortable as possible in the camp conditions. 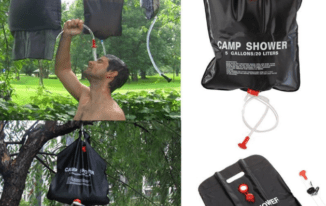 The volume of this portable shower is 5 gallons which is enough to take multiple showers during your trip. It is always good to stay in touch with your relatives and friends while travelling. Solar Battery Charger will help you to charge any device any time you need. 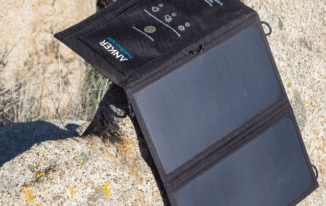 Portable Charger is equipped with solar panels and 2 USB outputs. This intelligent technology will help you fill up your smartphone or tablet. You can also charge any gadget which has an USB port. Battery Charger is light and thin; it will not take a lot of valuable space in your backpack while travelling and free you from the dependence of any electrical outlets. Those involved in hiking and camping understand the importance of using the right backpack. The backpack is like your companion in daily hikes: it either helps or disturbs you in long treks. Topo’s Classic 22L Klettersackis handmade durable backpack featured with an attractive exterior. 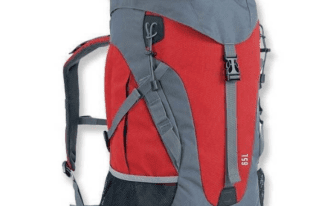 It has wide shoulder straps which allow for carrying large weight. Among its additional features are roomy side pockets, plastic hardware and special lash tabs to attach various useful items. There is a roomy top pocket with a zipper to store your gadgets. Topo’s Classic 22L Klettersack has one big compartment inside and additional space for the laptop. There is no need to explain that having first aid kit in your backpack is essential. First aid is a “must have” item when you travel to remote areas. Experienced travellers know that anything can happen during a trip. Pocket medical set doesn’t take much space in your backpack, but it can help you a lot some day or even save your life. This kit contains antiseptic wipes, painkillers, an oil-filled compass and a flashlight – 17 items in total. All items are packed into in a long tube which you can easily carry. This is an eco-friendly and handy travel gear which can be used not for only cooking, but also to charge your LED lights, smartphones or other gadgets while traveling. 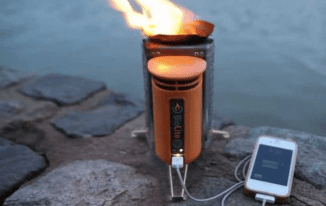 BioLite CampStove converts the energy from the fire into electricity.It was released last year and this version offers 50% more power if compared to the previous version. 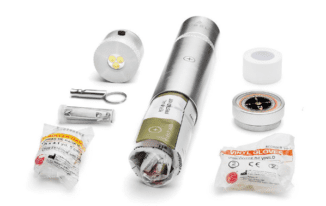 BioLite CampStove is equipped with a 2600 mAh battery that can be easily removed. A smart dashboard shows the current status of the battery and fan speed settings. It suits car camping more than a backpacking trip because it’s quite heavy – its weight is 2 pounds. This cooking gear will make your trip even more delightful as it adds the feeling of home comfort to beautiful views you’re enjoying during your trip. 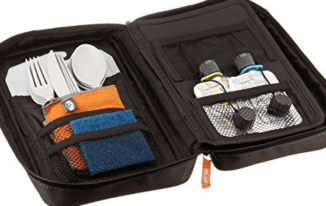 The GSI Outdoors Destination Kitchen contains 4 sets (24 pieces) of cutlery utensils. It includes various folding tools, including a utility knife, spice shakers and even a cutting board. 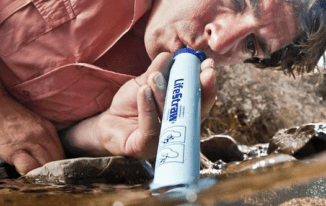 LifeStraw Steel Personal Water Filter is a perfect solution for adventurers. It can be used to drink fresh water even directly from a river or a lake! Its manufacturer – Swiss company Vestergaard – invented this wonderful travel gear for those having a passion for hiking and camping. Water that drops into this filter passes 2 stages of filtering during which all harmful impurities (chlorine), bacteria and protozoa are removed. It is also effective to remove bad taste and give you an opportunity to enjoy the fresh water on the go. The body of the filter is made of stainless steel and the purifying element contains an activated carbon capsule which can be replaced when itruns out its capacity. It doesn’t require a battery or electrical power.